Then, when he wants to be chill, he lets himself go and floats to the top. Nearly every time I walk by this is how he looks, if he's not swimming. 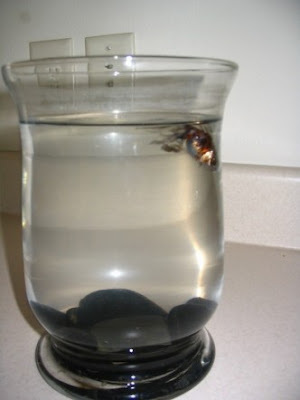 I see him there, his body still, his little white belly breaking the surface of the water, and for a few days I was just waiting for the time he would be dead. But no, every time I check on him, there's his little gills doing their thing, his little fish lips doing the little blub-blub that fish lips do. If he sees me he rights himself right away, like a dog rolling over and getting up again for a treat. Apparently, he's picked up a new talent, he just wants a change because he's bored, or perhaps this just makes him smarter, I don't know. Thanks for sharing your fishy story! I had a fish that did that when I was a teacher. Try explaining life and death to 25 kindergartners in a public school. Not fun! 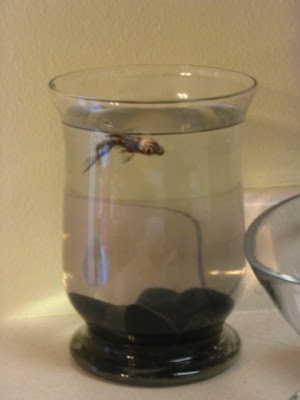 If I would have been smart I would have flushed Rainbow, our fish, at the first "fake" death!